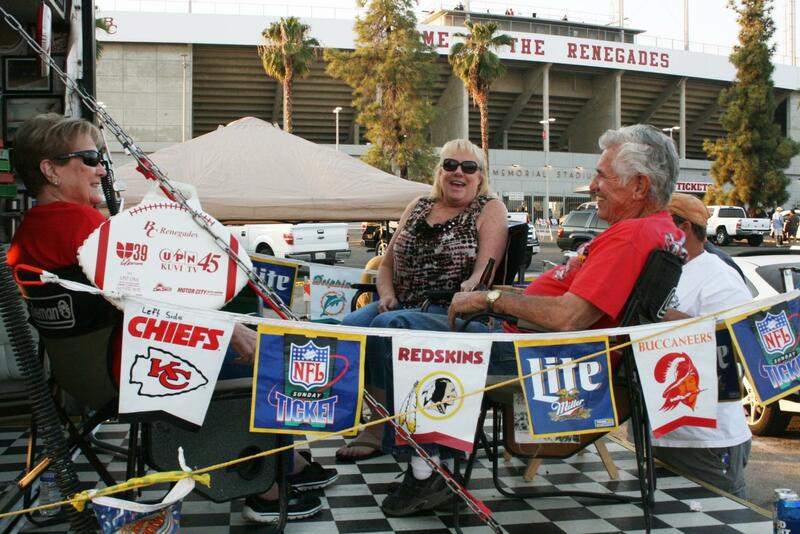 From the left: Barbar Lopez, 79, Karen Tallman, 57, James Tallman, 55, and Buddy Lopez, 83 throw their own tailgate party at the homecoming game. The Bakersfield College Alumni Association hosted this year’s Tailgade party on Saturday Oct. 14 from 3-6 p.m. prior to BC’s Homecoming game against Moorpark College. The association sponsored the white-tent event with a New York steak dinner where tickets sold for $15-$20 per person. Proceeds from the ticket sales go toward providing scholarships and athletic programs for Bakersfield College students, according to the BC’s Alumni Association. The white tent was impossible to miss earlier last week, which was strategically placed in between the Northside portion of the Memorial Stadium and the Math Science Building. The tent served as the event’s venue and was set up to seat 220 people, according to Joronco, one of the event’s contractors. Fred’s Barbeque Factory, a local catering company, grilled up the New York steaks. It was the first BC fundraiser that the catering company has been a part of, according to co-owner Julio Leon. Patrons lined up to grab a plate and seated themselves under the tent to listen to Mento Buru, a popular local “ska, reggae, mambo, jazz, world-beat band,” during the three-hour pre-game event. Even Mayor Karen Goh was present to show her support of BC’s Tailgade and homecoming game. Student volunteers from the soccer team and golf team were present, and engaged people in a game of Corn Hole on the lawn. They also promoted this weekend’s Corn Hole Tournament which will be held on Oct. 21 at Lengthwise Brewery on District Boulevard at 12 p.m., according to Brandi Borjon, a women’s golf player and sophomore at BC. Borjon said that her and the other athletic team volunteers were there “to create a fun environment” for Renegade fans, as well as bring attention to raffle tickets for the Corn Hole Tournament. The raffle winners will be invited to play with their own team for monetary prizes ranging from $200 to $600. While Renegade fans congregated, the Homecoming Parade rolled through with the BC’s Drumline, the Agricultural Department on their float, followed by Bakersfield College cheerleaders and the security detail. In the Southeast parking lot there were patrons with table spreads of foods, huge pits with spits and a variety of grilled meats. Children played tag football amongst the cordoned aisles, while adults socialized. The fire department was also present with an aerial ladder hoisted 100 feet in the air with the American flag displayed at the corner of University and Mt. Vernon Avenue.